It might be worthy to add that the 9/9 lunisolar date this Chestnut Festival (kuri no sekku) falls on would fall in October according the Gregorian calendar used today. In Anecdotes 77, Oyasama uses a chestnut as a metaphor for a person’s mind (kokoro, also potentially translated as “heart” or “mind-heart”). 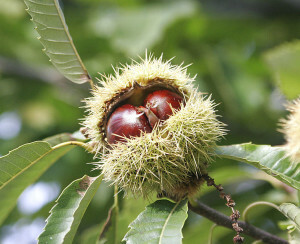 Although the “core” of each person’s mind-heart is “indescribably delicious” like a chestnut, three layers must be shed — the “rough and prickly bur,” the “shell,” and the “bitter coating” — before one gets to the tasty nut inside. There is the recommendation for a person to “listen to the truth” so to shed away these layers. “Truth” (ri) here could refer to Oyasama’s teachings in general or those that are more specific, regarding “God’s providence” (i.e., the “ten aspects of God’s complete providence”). The description of a mind being “delicious” also echoes portions of the Tenrikyo creation narrative (often referred as Moto no ri or “Truth of Origin” in English), particularly the portions describing God consuming the different “instruments” or creatures in the muddy ocean “to test/discern the flavor of their minds.” I imagine that a mindset that produces the best “flavor” would be selfless and be one closely aligned with God’s intention to bring about a harmonious and fulfilling existence for all. Tenrikyō Dōyūsha, ed. 1995. Ikiru kotoba: Tenrikyō Oyasama (kyōso?) no oshie. Tenri: Tenrikyō Dōyūsha.